Did you know that you can easily load Greasemonkey scripts into Opera? While Firefox users need an extension for that Opera users can simply import them into Opera. Well, some manual work is required but nothing to serious. Takes probably half a minute to import it. 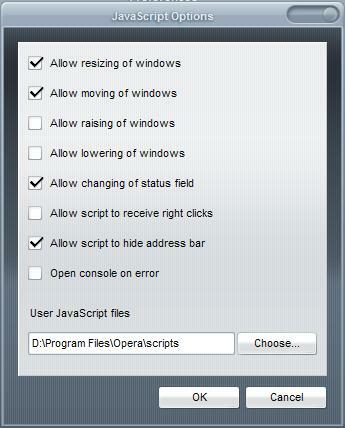 First you need to download the Greasemonkey script that you would like to use in Opera. You may need to rename that script so that the file ends with user.js if that is not already the case. Opera needs to be restarted so that the scripts can be loaded once the folder has been selected. After that it's just a matter of testing the scripts on whatever website they are working on. helps in supporting a few more and its by an Opera employee. Fantastic! Thanks for the tip. This will put me even closer to a full conversion from Firefox to Opera. help ! i test youtube lyrics (http://userscripts.org/scripts/show/22569). But it doesn’t work ! Thanks so much for this! Really helped out a lot! Well the demand of proxies will keep increasing day by day. Nice article by the way! does better twitter work for you ? The correct way to make the scripts work is to go to the script page and go to the script that you want, press in the Install button \and copy everything in the Notepad and save it like this “namethatyouwant.user.js” without the quotes and make the dir. To me the scripts work fine i used the You tube Enhancer and works really good. It’s nice that there’s a way to make scripts work in opera, but when you want ~30 scripts, this is not practical. Why doesn’t opera make an easy way to run them like Firefox, Flock, and Chome did?